Have a question? Let us know and we'll explain. Looking for a viable option for electricity? Many people either don’t have access to electricity in remote areas or it’s not affordable. Going off grid the way to go. Great for: camps, real estate investors, outdoor lovers, hunting cabins and those who just live in remote areas. 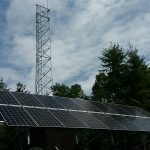 High Peaks Solar got its start doing off grid solar projects in New York and Vermont. Off Grid solar has never been more convenient and affordable than it is today. Our custom designed projects allow homeowners to live without the utility grid. We incorporate generators, either automatic start or manual start, to work with solar panels and batteries to provide reliable electricity 24/7. 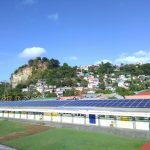 These types of off grid solar projects are ideal for remote properties where the utility grid it too expensive to extend. Our customers can enjoy many of the same electric amenities that those who are connected to the utility grid enjoy, without an electric bill. We can monitor our systems with off grid data systems connected to the internet. Off grid home owners can view their system’s information from anywhere with internet. If you are interested in learning more about how High Peaks Solar can help you live off grid, please give us a call today! 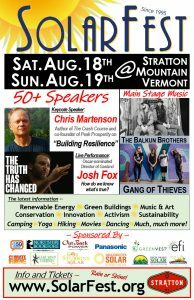 Join us at Earth Sky Time organic farm in Manchester, VT for a day-long gathering of workshops and music, along with great food and conversations. The doors open at 10:00 am, with activities for the whole family until 10:00 PM. This SolarFest Celebration is another opportunity to gather, share ideas, and learn how to best confront the challenges of our time. High Peaks Solar will be there to answer your questions about residential, commercial, off-grid and community solar choices. Let have some fun! See you there! 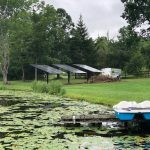 2019 is a pivotal year for the solar industry, especially for homeowners. The residential 30% Federal Tax Credit goes away for homeowners, while largely remaining for commercial customers. This policy shift shows an obvious change and desire for larger system installations. In New York, net metering for homeowners is vanishing at the end of 2019. Now is the time to buy solar for your home. You can lock into net metering and receive the full 30% Federal Tax Credit. We will be sponsoring this great event. Come by our booth to learn more about solar. Don’t miss it! High Peaks Solar has sold its first lithium battery system. This project will contain 24 solar panels, 1 Sonnen 10kWh battery bank, and an SMA Sunny Boy inverter. We will be connecting one 7,000 watt generator into the battery based system. The generator will be used to charge the batteries only where there is insufficient solar during a power outage. The lithium battery bank will be used to provide back up energy for the home owner’s well pump, refrigerator, furnace, and lights. Once complete, we will post photos of this exciting lithium battery solar install! In order to power your house with energy from the sun, you’ll need solar panels. But since solar panels generate DC (direct current) electricity, you’ll need some way to convert that DC electricity to AC (alternating current) in order to power the appliances in your home. Here’s where inverters come in. An inverter “inverts” DC output into AC. In addition to converting AC to DC, inverters also provide ground fault protection and real-time monitoring of system data (like energy production, voltage, and other useful info). The classic wall-mounted rectangular boxes that you may have seen in basements, garages, or on the side of a house. These inverters convert electricity from a string of multiple panels. When one individual solar panel fails, the entire system goes down. When one individual solar panel’s output falls (most likely from shading), the system’s performance drops to match the lowest-performing panel. These miniaturized inverters are sized to suit individual panels instead of a whole string. Each panel in a system must have a micro inverter attached to it. Each panel functions as an individual – if one panel is shaded, its performance won’t drag down the entire system. Problems can be easier to diagnose since each micro inverter monitors a single solar panel, not an entire system. Both types of inverter have pros and cons, but remember: as with just about everything involved with going solar, there is no “one size fits all” best answer. The most important thing is partnering with an installer who takes the time to help you design a system that fits your home and your needs.